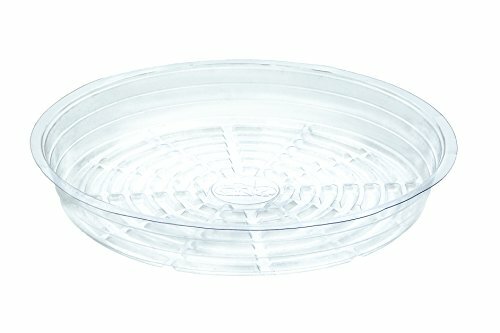 My Garden Kit Clear Plant Saucers 16 Inch Pack of 5 Great For Indoor Outdoor Flower Pot Drip Tray (5) by My Garden Kit at Tulips Orchids. Hurry! Limited time offer. Offer valid only while supplies last. CLEAR PLANT SAUCERS 5 PACK OF 16 INCH Maximum Protection : Prevent Mold & Mildew. Avoid Damaging Your Patio, Deck, Carpets, And Hardwood Floors. CLEAR PLANT SAUCERS 5 PACK OF 16 INCH Maximum Protection : Prevent Mold & Mildew. Avoid Damaging Your Patio, Deck, Carpets, And Hardwood Floors. Maximum Plant Growth : Never Underwater Or Over Water Plants Again! Clear Saucers Provide Proper Drainage And Airflow For Plant Growth And Healthy Root System. Multi-Use : Versatility To Match Any Room Decor. Great For Serving Trays, Candy Dish, And Food Containers. Excellent For Pet Food, Bird Bath, Bird Feeder, Herbs, Also Indoor And Outdoor Arts & Crafts! CLICK ADD TO CART NOW!!!!!! 100% Money Back Guarantee.. LOVE IT OR IT'S FREE! We Are So Confident That You Will Love Our Plant Saucer Set That If At Any Point You Decide You Are Not Satisfied With Your Plant Saucer, Just Drop Us An Email And We Will Refund 100% MONEY BACK TO YOU NO QUESTIONS ASKED!!!! 100% Money Back Guarantee.. LOVE IT OR IT'S FREE! We Are So Confident That You Will Love Our Plant Saucer Set That If At Any Point You Decide You Are Not Satisfied With Your Plant Saucer, Just Drop Us An Email And We Will Refund 100% MONEY BACK TO YOU NO QUESTIONS ASKED!!!! If you have any questions about this product by My Garden Kit, contact us by completing and submitting the form below. If you are looking for a specif part number, please include it with your message.